Successfully Added Q7 Bluetooth Karaoke Microphone - Bluetooth 4.0, Twin Speakers, Echo + Reverberation Effects, 2600mAh Battery (Gold) to your Shopping Cart. 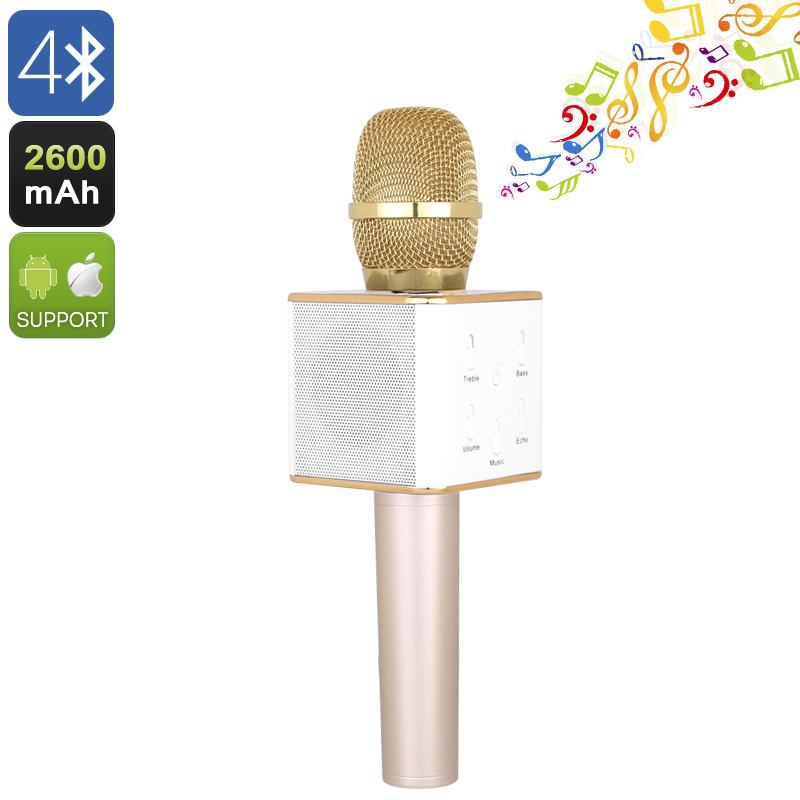 The portable Q7 Bluetooth karaoke microphone lets you experience the joy of Karaoke anytime, anywhere. With Bluetooth 4.0 support you can sync it directly to your Smartphone or tablet PC so it can play all your favorite tracks as you sing along with family and friends. Twin 3 Watt speakers will blast out up to 115dB of audio perfection and with Karaoke bar effects you can have the sound reverberate and echo around you. The perfect way to practices your singing skills or polishing up on those karaoke favorites, with the easy controls you can set treble, base and echo functions right from the device letting you create professional karaoke effects as you desire. A built in rechargeable battery offers up to 5 hours of play time and with a weight of just 375 grams its perfect for adding some entertainment to liven up your night out with renditions of your favorite artists. There is even a protective carry case so there is no leaven to leave it behind on your next night out. Coming with a 12 months warranty this Bluetooth condenser karaoke microphone lets you create your own karaoke session at home or on the go and is brought to you by the leader in electronic gadgets as well as wholesale microphones..